ÍF looked set for their first point of the season as the held EB/Streymur from scoring, but in the last 90th minute, Hans Pauli Samuelsen showed his sublime skills when he broke through ÍF's defense and scored. He's must surely be getting closer and closer to the national team. 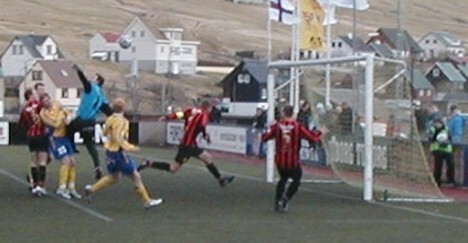 In injury-time, EB/Streymur doubled their lead. As B36 drew against KÍ, EB/Stretymur are now on top of the table with maximum points, 2 points ahead of GÍ and B36. On Monday, EB/streymur take on GÍ, who are now second. But can EB/Streymur win against a hardworking and hard-playing GÍ team? This will be a test for the EB/Streymur team and will show what they are really made of and how serious they mean business this season. ÍF will be desperate to get a result against KÍ on Monday, because they cannot afford to lose their first 4 games, if they want to stay in the division. HB made a perfect start to the match when Tór-Ingar Axelsen after 7 minutes broke through on the left and was brought down in the penalty area and the referee awarded HB a penalty. Jákup á Borg made no mistake from the spot. HB nearly made it 2-0 10 minutes later when they hit the post. Halfway through the first half, HB showed their weakness in defense, when GÍ without much trouble combined through the HB defense, and in front of goal, a clear Hans Jørgen Djurhuus had no problems steering the cross from the right into the goal for the equalizer. Just 5 minutes later, GÍ made it 2-1 after a goalkeeping blunder. Magni Jarnskorð struck a free kick from way out from the HB goal, but the HB goalkeeper just watched the ball and let in bounce right in front of him and into the top corner. Just before half time, GÍ were reduced to 10 men, when captain, Sámal Joensen was shown the red card for pushing a HB player, after he had brought down a GÍ player. Therefore, GÍ had a free kick just outside HB's penalty area and nearly made it 3-1 when the ball hit the left upright. The first 10 minutes of the second half was a frantic affair. HB started well and had a good long range effort, wile GÍ almost scored at the other end. Four minutes into the second half, HB equalized. A HB player broke down the right flank and from the goalline (and probably over it) crossed the ball into the penalty area, where Johan Ejvind R. Mouritsen, 20, volleyed it into the GÍ goal with aplomb! – A future start player for HB! (His younger brother, Christian Mouritsen, plays at Manchester City). But then, just a few minutes later, HB's captain, Janus Joensen, had a rush of blood to his head and got himself a stupid and unnecessary red card and HB lost its advantage with the extra player. And it didn't take long for GÍ to take the lead again. 10 minutes into the second half, HB's goalkeeper failed to collect the ball after a cross from the left and Kaj Ennigarð took advantage and headed the ball into the empty goal for a 3-2 lead. On the picture above, GÍ's goalkeeper fails to connect with the ball, but so did HB's attackers (black and red jerseys) and the ball went just wide of goal. HB tried their best to put pressure on GÍ after that, but rarely did they produce clearcut scoring opportunities. GÍ held on, and are now lying second on the table after, 2 points adrift of EB/Streymur. There is still time for HB to make up lost ground, as there are still 24 games left, but to do that, their defense has to improve considerably. – Also players have to mature and stop getting unnecessary cards, especially reds. This was HB's second red this season; one today and one in the cup game against VB/sumba. HB's new signing, Jovan Radinovic-Panic, from Serbia, watched the game from the side line. HB expect it will probably take 2 or 3 weeks, until he gets all the necessary papers, so that he can start playing. The initial contract is only for 3 months, but if he does well, HB will lengthen the contract. After the draw against B68 today, NSÍ has still not showed any evidence for why they were judged to be one of the favorites for the title this season. But they'll soon have to, if they want to challenge for glory. 1 point in 2 home games isn't going to be enough. Súni Fríði Barbá again scored B68's goal today and they'll be happy with the away point as this will keep them above ÍF and VB/sumba. VB/Sumba must already be seeing the handwriting on the wall. Another heavy defeat today and 13 goals against in their 3 opening games – 10 in their last 2. Doesn't look good for them. And on Monday, VB/Sumba take on B36. Another heavy defeat lures… It's difficult to judge Skála from today's performance, but they have another good chance for 3 points on Monday against B68. KÍ Klaksvík aren't easy to break down and the coach's, Tony Paris, “confidence-recipe”, which he feeds his players with, seems to be working so far. Having said that, it took B36 only 20 seconds to score today (the goal created by Fróði Benjaminsen and Sylla), but the KÍ-team now has the character to come back from such shocks. KÍ's goal came from a direct free kick taken by dead-ball specialist, Iulian Florescu. B36 nearly made it 2-0 shortly before half time, but dos Santos' shot hit the crossbar. Kí on the other hand could have taken all 3 points in the second half, but Símun Joensen blasted the ball over the goal from close range when it was easier to score. It will be interesting so see if KÍ can keep going at this pace. – So far, there is no reason to believe otherwise and their match schedule for the next couple of rounds doesn't look to scary. B36 will have two easy games, VB/Sumba and B68, before they encounter HB in the local derby on April 26.